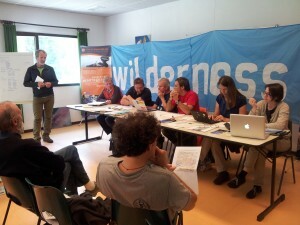 On June 14, 2014, the biennial General Assembly of Mountain Wilderness International was held in Argentiere (Haute-Savoie) with 44 delegates representing eight of ten of Mountain Wilderness associations (Germany, Catalonia, Spain, France, Italy, Pakistan, the Netherlands and Switzerland). This meeting was an opportunity to take stock of the activities of the association for two years. From an administrative point of view, the executive team set up in 2011 and expanded in 2012 with a Treasurer enabled a new momentum, including: a higher frequency of operational meetings and a better structuring of the activity, as well as new rules for contributions of association members and, for the first time, a provisional budget. Renewed and extended, it is still headed by the President Jordi Quera (Catalonia). Though international projects are struggling for achievement due to lack of volunteers to implement all the actions, the Asian desk, headed by Carlo Alberto Pinelli, had a strong presence for Mountain Wilderness in the Himalaya-Karakoram-Hindu Kush region. A training for trek guides and high altitude porters was successfully held at Passu (Pakistan) in September 2013, it was followed by a refresher course, in May 2014, organized by Mountain Wilderness Pakistan. In Val di Mello (Italy) Mountain Wilderness International will take the management of a former mountain pasture building transformed into an information center for environment and wilderness protection during the summer time. Volunteers who wish to engage in this adventure may contact MW International. A test period should be conducted this summer as a prerequisite before making a six years rental commitment. Several new actions have been approved by the Assembly: a training course for trek leaders and staff in Ethiopia, a special training dedicated to women guides in Nepal (Sherpa Women) with Salewa and a full crossing of the Alps project by fair means. Some projects have been put on hold such as the Scandinavia wilderness crossing. The footprint project (aiming at measuring the human impact on the main world’s ranges) is expected to be reactivated. The major assembly’s goal set for the coming years is to further develop both internal and external communications. The website should be expanded, and a presentation brochure in English as presented at the meeting will be published. The growth of member associations and active volunteers is also a priority. Along with this, Mountain Wilderness welcomes a new member, Mountain Wilderness Austria, created in 2013. Notwithstanding a relatively limited success, the fight for Mont-Blanc protection continues, the Assembly adopted a proMONT-BLANC, motion requesting a stronger commitment of competent authorities in the preservation process of the range. The picture painted by the national organizations clearly showed that most of the Mountain Wilderness actions take place right there in the regions, but also that the main topics dressed by MW span all aspects of the mountain protection. The GA decided to hold a strategic meeting, open to all those who feel concerned, to think and debate on the organization’s future and on directions to give to its projects. Delegates, after a productive day, have decided to meet in two years, in Catalonia.